Jake: Finn deserves to be happy, even if his blooping face gets burned off! The thing that surprises me most about Adventure Time is how it’s been able to sustain its impossibly high standard of quality over the life of the series. Over and over again, in just 12 minutes per episode, the creators of the show are able to tell stories that run the gamut of seemingly every human emotion on the spectrum. All under the guise of a children’s show that is nevertheless deeper and more resonant than most “adult” programs; ones that often try too hard or take themselves altogether too seriously. 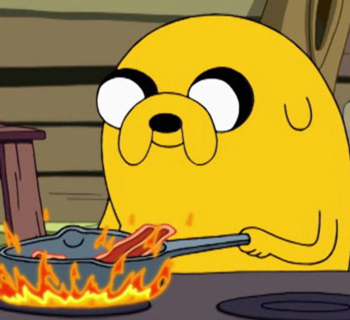 Somehow, in the middle of all of its other storytelling techniques, Adventure Time also manages to incorporate music and songs as an important feature, and the season four episode “Burning Low” has one of the all-time greats, “Bacon Pancakes”, written by Rebecca Sugar and sung by John DiMaggio. Deceptively simple, the song has inspired fans to try their hands at putting bacon in pancakes. Here’s my attempt at making this recipe. For this recipe I went all out, with not just instructions on how to make the pancakes, but specially-made walnut butter and syrup as well. I figured that if I was going to give this a try, I might as well do all of it. So this jumbo-sized entry contains information on all three elements. Cook the bacon until crispy, then dice and set aside. Combine dry pancake ingredients (flour, sugar, baking powder, baking soda, salt) in a large mixing bowl. In a separate bowl, whisk together wet ingredients (eggs, buttermilk, melted butter), then slowly add the dry ingredients until mixed thoroughly. Heat nonstick pan over medium heat and coat with nonstick spray. Using a serving spoon, carefully place a large spoonful of batter on pan, allowing the batter to fall straight off the top of the spoon and naturally form an even circle. 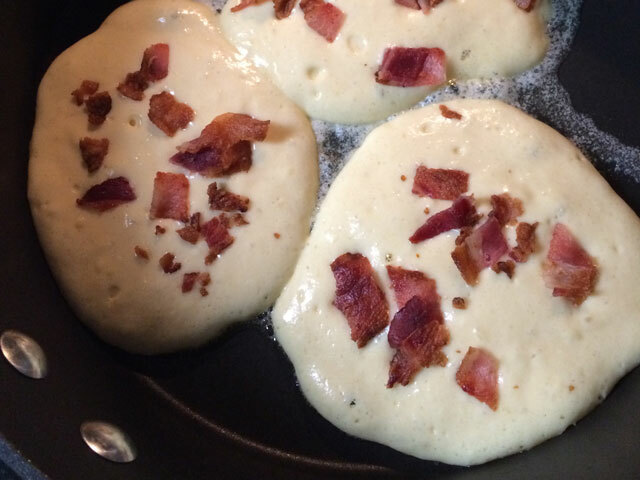 Cook until bottom side is nicely browned, then sprinkle the crisped bacon generously onto the pancake and flip immediately to cook the other side and seal the bacon into the pancake. Continue with the remainder of the batter. Preheat oven to 350 degrees F and place walnuts on a baking sheet in a single layer. Toast in oven for 12 to 15 minutes. 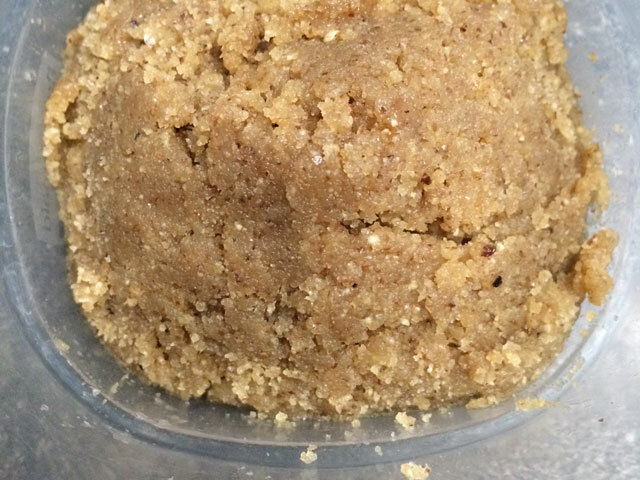 Once the walnuts have cooled, place them in a food processor and process until they have reached the consistency of a paste. Slowly add the rest of the ingredients until mixed thoroughly. You may need to scrape the sides of the food processor throughout the process in order to make sure the walnut butter is combined well. Combine all the ingredients in a blender or food processor and blend at high speed until thoroughly combined. Place in a container, cover, and chill for at least two hours. This will allow the jelly to firm up a bit. 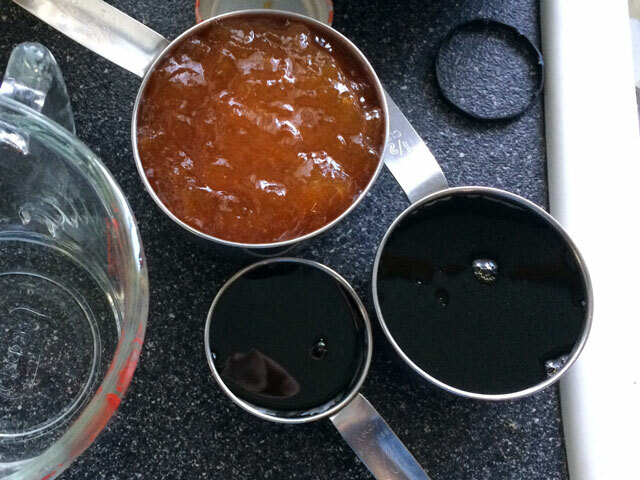 This syrup (which has three ingredients and one step) didn’t firm up very much at all, despite the thick jelly added to it. The maple syrup I used was pretty runny to begin with, which might have had something to do with it. The taste, though, was very good, and it went well with the salty bacon. 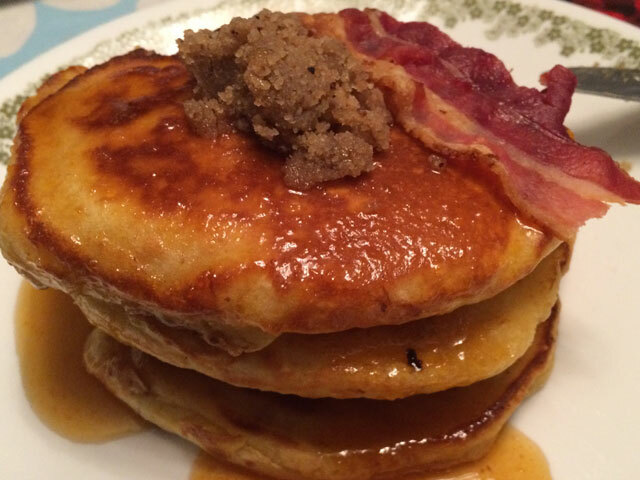 Dress the pancakes with as much walnut butter and maple jelly as you’d like and serve immediately. The walnut butter is sweet and flaky, that combines its different ingredients perfectly. Try this butter! Try it on pancakes, and things other than pancakes! It’s a solid 9/10. As for the maple jelly, I think the pancakes would have tasted just fine with regular maple syrup too. I’ll give it an overall 7/10. It’s worth trying. The bacon pancakes had the perfect blend of salty and sweet, and the butter and syrup just added to the all around delicious flavor. I’m not someone who usually mixes food in this manner, but this one was a winner from start to finish. The presentation was good and the portions were hearty. This one took some effort to make everything involved, so it’s not a quick meal, but it’s one that I’ll make again. I’ll give it a 9/10. Fionna and Cake, the Bizarro World, gender swapped, fanfiction opposites of Finn and Jake, have their own little corner of the Adventure Time universe to play in, and they’ve got a large fan following in their own right. I’ve always thought that gender swapping fictional characters was kind of an odd choice, but the cartoon at least does a decent job of explaining its place in the show. 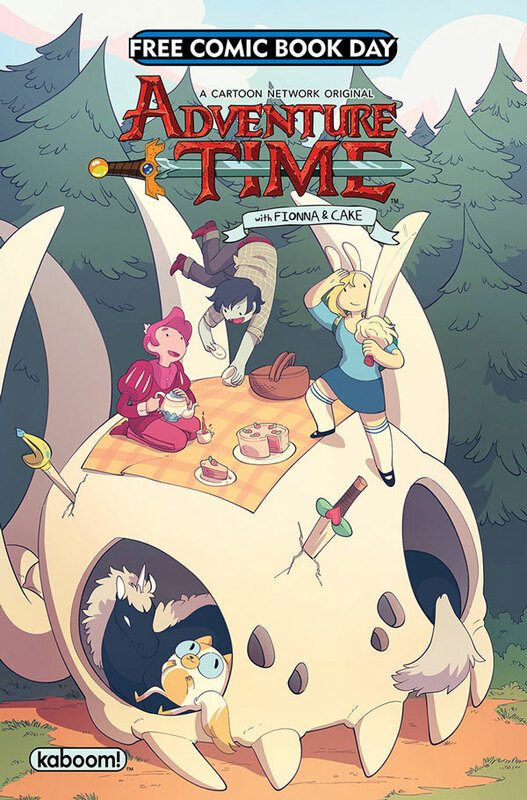 This issue takes the concept a step further, where Fionna and Cake imagine what their gender swapped equivalents would be like, adding a new layer to the distortion and creating two new adventuring heroes in the process. I enjoyed this issue because it was a full-length story, which is a rarity for FCBD comics, and because Larsen is one of my favorite artists (I’ve had the pleasure of working with her a few times in the past). Her lettering is also a treat, and I’m glad that KaBOOM! allowed her to have such a creative influence on this story. As someone who has eaten questionable meat from convenience stores over the years…rancid meat attack! Stupid parasites! Is there no way I can find justice? 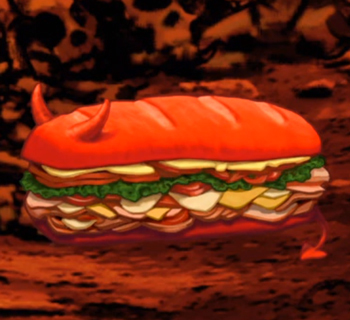 …I find the idea of eating Meat Man kind of terrifying too. That does seem like a problem and I’m not sure if there is a way of finding justice here. 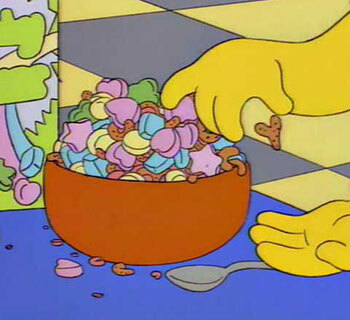 But those problems can just stay between us and that smashed hat on the ground over there.